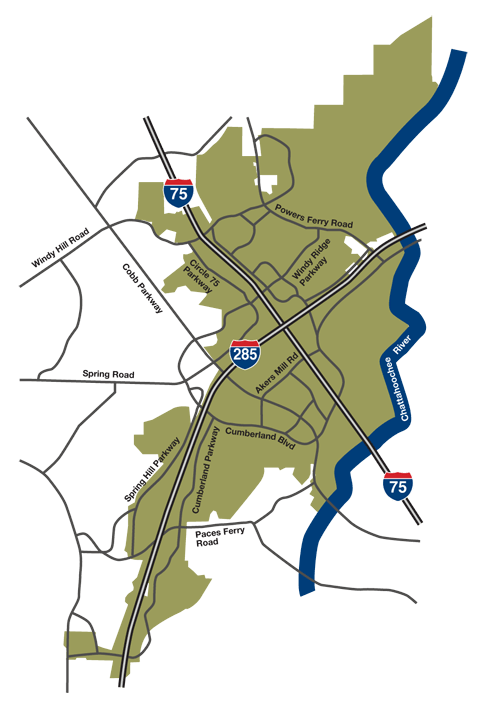 The Cumberland Community Improvement District (CID), Georgia’s first CID, is a public-private assessment district in northwest Atlanta. It is the mechanism by which local commercial property owners advance needed public infrastructure projects. Projects that enhance property values as well as the greater community. Originally formed in 1988 by business leaders interested in improving access to the highways for the emerging Cumberland submarket, the CID, currently representing 190 commercial property owners (residential excluded), went a step further and created a master road plan for the area. Over the years, that original plan expanded to include additional road and transit infrastructure improvements, streetscapes and beautification projects, bicycle and walking trails, alternate commute programs and services as well as community planning. COMMERCIAL INVESTORS FOOT THE BILL. THE CID IS MADE UP OF 190 COMMERCIAL OWNERS WHO REPRESENT A THIRD OF THE LAND, BUT AMOUNT TO 60% OF THE $6.1B VALUE (this includes exempt property). Commercial property owners within the Cumberland area fund the Cumberland CID by paying an additional five mills of property taxes. Cobb County collects the taxes and distributes those funds to the CID. The CID currently collects $6 million annually. Between the years 1988 and 2018, the Cumberland CID will have committed approximately $140 million of the business community’s own money to a multitude of local area improvements. These funds will have leveraged much more. Please visit RESOURCES for more information on the CID’s financials and impact. The Cumberland CID, like all Community Improvement Districts (CIDs) in Georgia, was founded upon the basis of Article 9, Section VII of the Georgia Constitution. The amendment providing for CIDs was approved by the voters in 1984. Although the Constitution allows for CIDs, local legislation providing for a CID in this unincorporated part of Cobb County was also required from the Georgia Legislature. Without such local legislation, no CID may be established within any jurisdiction in Georgia. 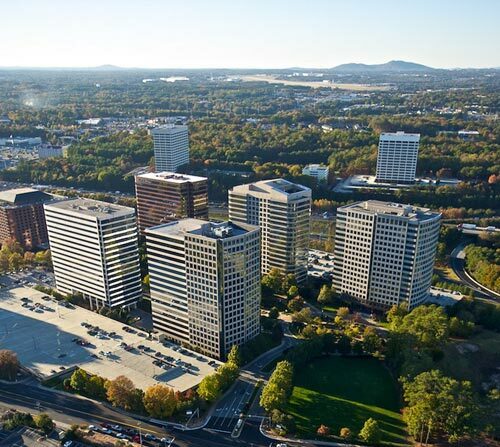 The Cumberland CID was brought into being through the enactment of a resolution by the Cobb County Commission and the consent of the commercial property owners in the Cumberland area. In fact, at least 51% of the property owners representing at least 75% of the property value agreed to have their properties included, so that a majority consent of the owners is achieved. The Cumberland CID is a 6 ½-square-mile area about 10 miles northwest of downtown Atlanta. Located in unincorporated Cobb County, it encircles the intersections of I-75, I-285 and U.S. Highway 41, with one another. The CID encompasses the heart of the thriving greater Cumberland submarket. The CID’s boundaries are determined by the consent of the local commercial property owners. Please visit MAPS for the CID’s boundary map. (1) Street and road construction and maintenance, including curbs, sidewalks, street lights, and devices to control the flow of traffic on streets and roads. (2) Parks and recreational areas and facilities. (3) Storm water and sewage collection and disposal systems. (4) Development, storage, treatment, purification and distribution of water. (5) Public transportation, including, but not limited to, services intended to reduce the volume of automobile traffic, to transport two or more persons, to improve air quality, and to provide bicycle and pedestrian facilities and the operation of a Traffic Management Association or similar entity. (6) Terminal and dock facilities and parking facilities. The Cumberland CID board raises funds by setting an ad valorem millage rate on real property, specifically excluding property used residentially. The Cumberland CID has set the millage rate at five mills, which is the maximum set by the Cobb County CID Act. The millage rate is placed upon the regular tax bills sent by the Tax Commissioner, who transmits the collected taxes to the CID board for expenditure in accordance with the purposes of the District. Rather than funding new projects in their entirety, the CID maximizes its assessments by leveraging its money through funding preliminary engineering and design. When construction money becomes available from the feds, state or county, the advanced CID projects are ready to go. This saves the CID and the municipalities time and money and accelerates important community needs. Thanks to its foresight and effective public-private partnership with its government partners, to date the CID has already leveraged approximately $140 million into about $2.5 billion worth of projects that benefit the community every day. The projects created by this investment are chosen, designed and constructed with the community in mind, making the area more accessible and more attractive for retail and other amenities to enter the market. A billion and a half dollars in commercial property value has been added to the community since 1988 to just under $3 billion today. Add in residential property value and the total community assets today exceed $4.4 billion. Another billion and a half in commercial value is projected over the next decade, estimated to increase from just under $3billion to $4.2 billion. 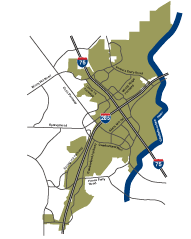 Cumberland Blvd., a five mile loop road encircling the I-75 and I-285 interchange. Interchange construction and widening, providing direct access from the interstates to area office parks. Bridge reconstruction and widenings of the main thoroughfare (Cobb Parkway/U.S. 41) connecting Cobb and Fulton counties. 38 miles of multi-use trails for safely connecting pedestrians, cyclists, and other users along busy corridors. 13 miles of streetscape treatments to provide a more beautiful and friendly environment on select primary and secondary roadways. Corridor widening and improvements, including Windy Hill, Powers Ferry, Cobb Parkway, and more. Decorative gateway signs to identify the Cumberland community. Landscape installation and maintenance to almost 20 linear miles of area roadways. Transit planning and community master planning to assist Cobb County with the community’s long term growth challenges.